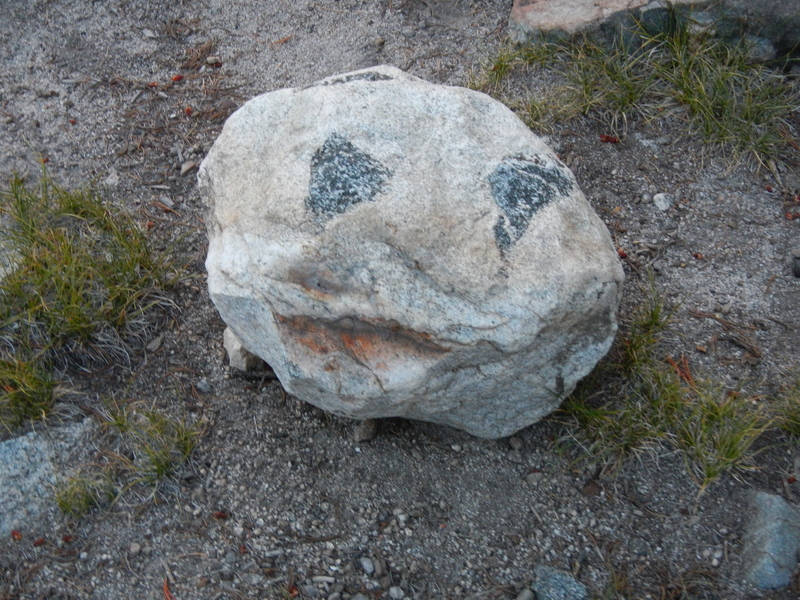 Do you avid blog-readers remember the photo of the rock that I posted on Day 18, at our campsite at Rae Lakes? In case you don’t recall, here is the photo again. FYI, the rock is about two feet wide. This made me very happy that I had decided to snap a photo of it. Think of it as a High Sierra jack-o-lantern. I hope you all had a happy Day of the Dead, Hallowe’en, All-Saints’ Eve, Samhain, or whatever other holiday you celebrated or may be celebrating around now. Thanks, Laurie. I’ve shared your positing with Sean. And very cool about the pumpkin-ish Hallowe’en, Day of the Dead, etc., holidays visual connection. That is very interesting! Thank you for posting this update. It makes me sorry that I didn’t pay closer attention in my college geology class long ago. I’ll bet this professor’s students do pay attention to his good, clear explanations.